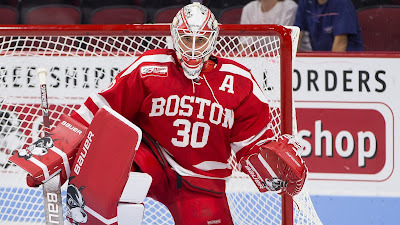 For the first time in the 100+ year BU-BC rivalry, the Commonwealth Avenue rivals played to a scoreless tie. Saturday night’s contest at Conte Forum was the 279th in the series. The Eagles enjoyed a decided shot advantage, especially in the second period, when they poured 14 shots on BU’s Jake Oettinger. The junior netminder made 42 saves while BC’s Joe Woll stopped 26 Terrier shots. 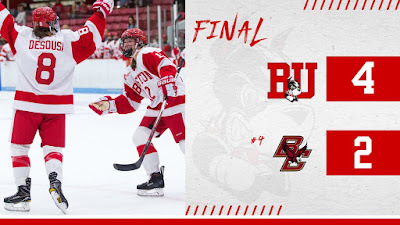 BU’s best two scoring chances were Bobo Carpenter’s shot off the post in the second period and Joel Farabee’s breakaway in the final seconds of overtime, which Woll turned aside. For Oettinger, it was the 10th career shutout. He’s third on BU’s all-time list behind John Curry and Jack Ferreria. ► Sophomores Shane Bowers and Cam Crotty have been named to 34-man selection camp for Canada’s World Junior Championships team. Clayton Keller scored his eighth goal and added two assists in the Coyotes rout of St. Louis, 6-1. Jordan Greenway scored his fourth goal in Minnesota’s 5-3 loss to Toronto. Behind a pair of goals from Abby Cook and 37 saves by goalie Corinne Schroeder, BU defeated #4 BC, 4-2, to complete its first-ever weekend sweep of the Eagles at Walter Brown Arena. After BC took an early second-period 1-0 lead, Cook scored on a blueline blast on a power play at 4:50 and did so again at 11:46. Deziray DeSousa added a third power-play goal late in the period for a 3-1 lead. BC cut the margin to one early in the third, but Schroeder would stop the other 18 Eagles shots. Jesse Compher’s empty-netter closed out the scoring. Sammy Davis was named Hockey East’s Player of the Week after producing a goal and six assists in three BU wins. 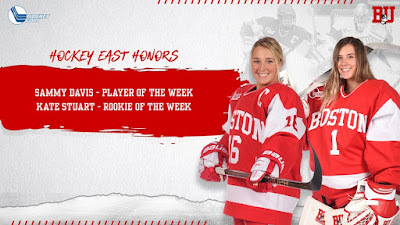 Freshman goalie Kate Stuart won Rookie of the Week honors after making a career-high 42 saves in Friday’s 3-2 win against BC.